This is a short tutorial on how to make a Trail in As3 flash (Flash Develop or Adobe Flash). 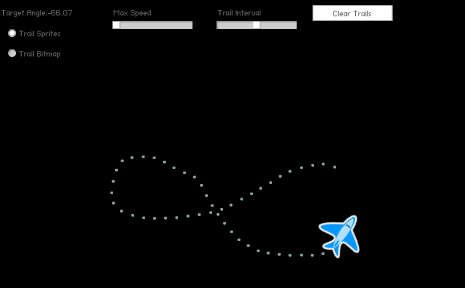 While making MinBa or Minimal basketball, i created a simple trail quickly. It was pretty simple to do, at least i think it is. Instead of posting the Code, i’ll summarize the steps i did. 1. Create a pool of around 50 dots (sprites with a circle drawn) and made it invisible. 2. Keep track of visible dots by keeping a poolindex and poolcount(for reseting). 3. Show one dot by passing x & y value of the tracked object and made visible that dot at that location. 4. [Optional] kept a timer to put some duration between placing the dots (kept it at a distance). So after a while i thought, why i need a pool and stuff like that, when i can just draw a circle again and again onto a bitmapData. That seems pretty neat. Skip the above steps 1 & 2. Feel free to add in your comments, doubts etc.